Since your business is growing from day to day, and fund transfer has played an important role in your global business, we have innovated a new way to enhance our products and services quality delivering to you. 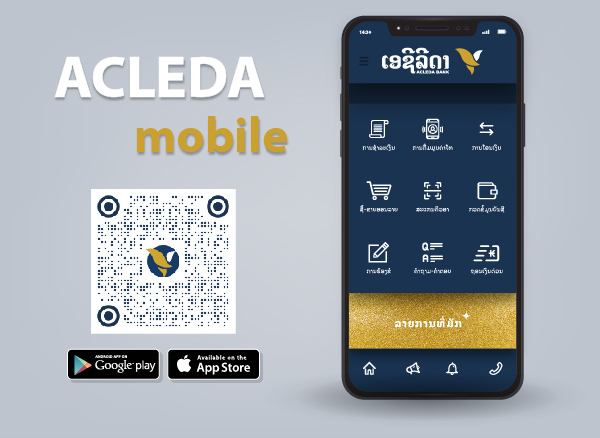 Recognising the need for its customers to lower the cost of transferring money from end to end, ACLEDA Bank Lao registered with an international level financial message transfer service — SWIFT. Transfer out in condition "Guaranteed OUR"
Name ACLEDA Bank Lao Ltd. Address #372, Corner of Dongpalane and Dongpaina Road, Unit 21, Phonesavanh Neua Village, Sisattanak District, Vientiane Capital, Lao PDR. Please click on any currency in the list below of our principal correspondents for its remittance instruction respectively before making any transaction. Other than SWIFT, we also provide international money transfer service through Western Union Money Transfer.